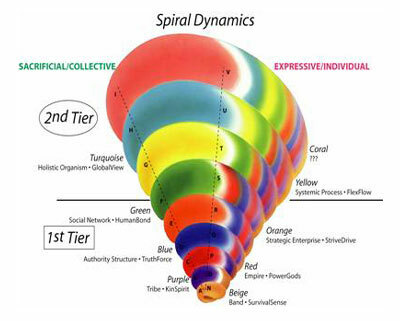 Spiral Dynamics (SD) is a system of understanding societal values (or vMemes) based on Psychology professor Clare Graves’ work from the 1970’s and furthered by Don Beck. More recently, it has been combined with the work of Ken Wilber and Integral philosophy to further understand humanity. SD focuses on sets of hierarchical values and needs that must be met before progressing to the next level. Although there has been controversy around the hierarchical nature of these values definitions, SD gives a good outline of the various values, focus, and consequently identity of different people at different stages in their lives. Where do you see yourself in the spiral?